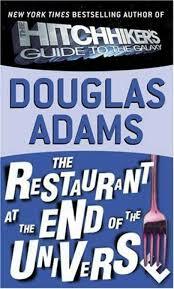 The Restaurant at the End of the Universe begins just as The Hitchhiker's Guide to the Galaxy ended. Arthur Dent, Ford Prefect, Trillian, and Zaphod Beeblebrox have just left the planet Magrathea when they are attacked by a Vogon ship. They find they are unable to use the Improbability Drive to escape, as Arthur has accidentally jammed the computer with a difficult request for a cup of tea. Luckily, an ancestor of Zaphod's, Zaphod Beeblebrox the Fourth saves them. Zaphod and Marvin vanish, and reappear at the offices of the Guide on Ursa Minor Beta. They are looking for Zarniwoop, who has gone on an intergalactic cruise in his office via his virtual universe. Arthur, Trillian and Ford are unaware of any of this, knowing only that the computer has been shut down, and only having received a message from a stalling Nutrimatic that says "Wait."